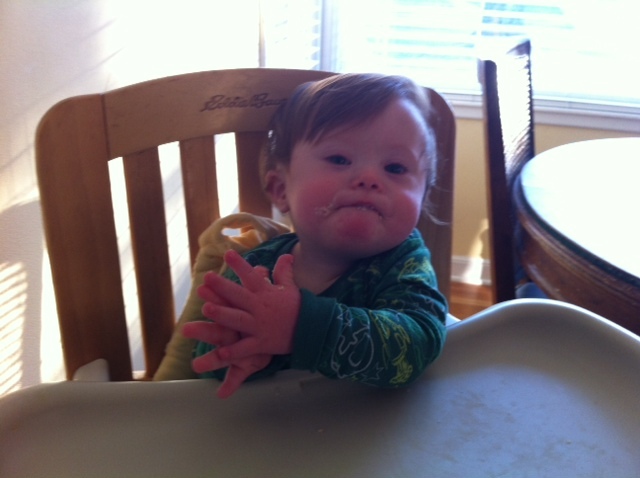 Timothy had his one year check up with his pediatrician a few weeks ago. The check up went well and she was pleased with his progress. At one point, the petit performer was sitting on my knees, facing me. Grabbing my hands, he pulled himself up to a standing position like a gymnast sticking a landing. And then, proud of his feat, he turned his head to the left, looked at the examining physician and gave her a big smile. That’s my boy. At the one year check up, his pediatrician said that we should alter both his eating –adding real milk to his formula, giving him a greater variety of solids (eating some actual table food) and weening him away from the bottle to a cup or sippy cup. And also adjust his sleeping – by putting him down when he was not quite asleep in order to get him used to putting himself to sleep (whereas up to now we’ve relied on the comfort of a late feeding to put him down). This all makes sense, but eating and sleeping are pretty much the core of our family’s lives. If we had any doubt of this, we need only to look at our long family car trips, which are the family petri dish, displaying all the colors of the rainbow in behavior from the Lees. On these trips, we are most crabby when we are either tired or hungry. Bottom line, the most sensitive behavior knobs in this house are hunger and sleep, and here we are adjusting both of these at the same time for little T.
His sleeping is going well, though we’re having to sometimes let him ‘cry it out’, which can be painful to listen to. But it’s important for him to realize that he can ‘self soothe’ and that he can go to sleep on his own. His new liquid diet of whole milk in addition to his formula didn’t seem like a big deal. However, the first time he spit up we got a wake up call. There’s a fine line between formula and milk, but once it’s been swallowed, the similarities end. Spit up from formula is white and pure, and barely smells. The lack of smell has been critical, because we’ve gotten used to wearing outfits with tasteful splashes of spit up. But backed up milk is not so lucky – it’s simply vomit. So adding just a little milk to the diet of a baby who spits up leaves your house and clothing smelling like the basement of a fraternity house (which is not a great smell, for those who do not remember their college days). I was fortunate to spend last weekend with a wonderful group of women in their 60s. We were up in the Boundary Waters and the group was reuniting to celebrate their 1965 expedition, which was the first Outward Bound women’s course, and which occurred in the same area. It was neat to see this group come together to talk about their lives, what they had learned over the years and their memories of the experiences that they had shared almost five decades earlier. Most of them had not been in contact with each other during the intervening years, but they quickly picked back up their old conversations and enjoyed talking with each other. And ironically, this group has been touched by cognitive disability, with one woman having a 65 year old sister and another with a 30 year old son with Down syndrome. I’ve written often in this blog about how our time with Timothy has shown us that we need to focus on the present, to really appreciate the people and happenings of our daily lives. As I watched the animated, emotional conversations of these women, it reminded me that we also need to work hard to not lose touch with our past. Our family has tried in recent years to stay connected with those long family car trips, where we dragged the kids through 48 states. The best part about those trips was visiting and talking with old friends who live in other parts of the country. Instead of having a reunion, we just drove to see them. We need to keep doing that, because those trips are a blast. This entry was posted in Doctor, Eating, Sleep, Too much advice and tagged liquid diet, new dog newer tricks, Outward Bound. Bookmark the permalink.